Well in our exploration of the Gospel of John we have now entered into the Book of Glory and left the Book of Signs behind. To review where we have been: Chapters 2-11 took place over a time period of 3 years; they contained 7 signs, several encounters and discourses or teachings. Chapter 12 leads us from the final dramatic sign of Jesus raising Lazarus through Jesus’ anointing and entrance into Jerusalem. The Book of Glory, beginning in chapter 13 and running through the end of the Gospel in chapter 21 will give us the final 3 days of Jesus’ life, including the last supper, the final discourse or teaching to the disciples, the arrest, trial, crucifixion, burial, resurrection and resurrection appearances. And in this final section we will experience God’s Grace upon Grace in a way that we have not experienced it before - namely God giving God’s self completely for the beloved creation – The Incarnate, enfleshed God crucified on the cross and then defeating the power of death! But first, one more sign, followed by one more discourse or teaching followed by a prayer and then Jesus’ ministry will be concluded. Jesus and the disciples meet one last time to share a meal together. The disciples and perhaps a few other followers assemble together and take their places. Now in 1st century Palestine the principal way to travel from place to place is by foot. The disciples and followers have followed Jesus through the day and have been walking the streets of Jerusalem. Some of these streets are cobblestones - that is large stones placed in such a way as to enable and support a fair amount of traffic, people on foot, horses, chariots and lots of other animals. These roads were engineered by the Romans who also built highways throughout the entire empire. But at the same time once you would get off these main thoroughfares there would be no paving, the allys and side streets would be dirt roads. Also, bear in mind there are no sewers, no drainage and very little rain. And so walking the streets and roads of 1st century Jerusalem was a dirty and we might even say rather disgusting thing to do. The result is that since you are wearing only sandals, your feet would get very, very dirty. This is what love is, Jesus tells them. Love is serving one another, caring for one another, getting down on the floor and washing the dirty tired feet of one another. This is what it means to “Love one another” and that is what you are to do. And, by the way, it is not optional – it is a new commandment – “Love one another!” And what does this love look like – it looks like Jesus, God incarnate, the Word enfleshed – on his knees carefully washing the feet of those whom he loves. And whom does God love? Who does Jesus love? “… God so loved the world!” Jesus told Nicodemus back earlier in chapter 3. And who is it then that we are called on to love? We are called to follow Jesus’ example and love the world as well, to the best of our ability and through the power of the Holy Spirit, who is also known as the Advocate – the Comforter – the Wind of God who is constantly blowing across the forces of chaos and bringing order and life out of chaos and death. This sign and the subsequent discourse with answer the question - what does it mean to be a disciple of Jesus? What does it mean to be a child of God? To what are we called and empowered to do by God’s selfless love and grace and power? The answer: we are called to “Love one another… Just like Jesus has loved us.” This is hard for us, because we don’t really want to do this. We are happy to love those who are close to us, those of our own community, those who do not challenge us, those who are just like us – but loving others who don’t fall into the narrow categories we humans like to create – that is not so easy. That we would rather not do. So instead we turn our faith into an exclusively personal journey that is only about me and God and about what God can do for me and about personal morality. And certainly all of that is a part of the journey to which we are called, but it is only a part, the other part is profoundly and starkly represented in this sign of Jesus washing the feet of the disciples. And that is, to love one another as he has loved us. To love the world as God has so loved the world. Peter reluctantly agrees and will continue to struggle with all of this, because frankly he doesn’t want to do it either. He doesn’t want to have his feet washed by Jesus the Messiah, God enfleshed, and he certainly doesn’t want to serve and wash the feet of others. Peter has good intentions but when push comes to shove he is weak and fearful and denies Jesus in order to save his own skin. And even in his last encounter with Jesus it is obvious that he is still struggling with love. But Jesus accepts him where he is and promises to be with him and to continue to love him as he struggles and grows. This is a model also for us, because we are very much like Peter. We are sometimes weak and fearful and we don’t want to serve like Jesus calls us to and we aren’t sure about our own commitment. But Jesus loves us and is committed to us anyway and promises to be with us, to maintain the relationship and to nurture and love us even as he continues to push us and call us to open ourselves to this calling. But there is another model, and this is the model of complete rejection; the model of Judas, who rejects relationship with Jesus, who rejects God’s love and grace who rejects the call to love as God has loved him. Judas has put himself outside of the sheep fold and when he appears in the Garden of Gethsemane he would be outside the sheep pen just like any thief and robber who does not love the shepherd or the sheep. When Judas leaves the gathering, we are told significantly, it is night! He has rejected the light and now dwells in darkness. His relationship with Jesus, with God and with others is broken. But Jesus, while knowing and accepting this, nevertheless loves Judas too. Please note: the incident with Judas happens AFTER the foot-washing. So, Jesus had washed Judas’ feet too, Jesus had shared his meal of bread and wine with Judas as well as with the other disciples. Because ultimately that is what this faith of ours is about – it is about LOVE – unconditional love! Jesus will go on to share with his disciples some thoughts about this love and grace of God’s, about this calling to love one another in what is called the Farewell Discourse. Like the disciples though, as we hear those words, we should be able feel the clean dampness of newly washed feet as we remember that it was Jesus who did that for us. It was Jesus who washed to dirt and the grime and the hardship and the misery away through that act of love. 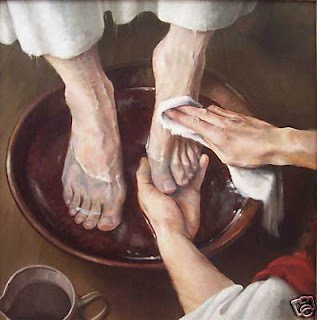 And it is Jesus who calls us to wash the feet of others, all others, just like he had done for us. This is the embodiment of God’s love for the world. This is what it means to believe – to act in love, to serve, to wash!